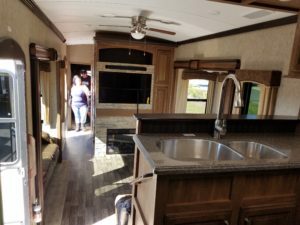 One luxury RV stands out so incredibly above the rest, that despite its size and its extravagance, and the fact that we don’t yet have a vehicle that could tow it, we were drawn in like a moth to the flame. I speak of the Keystone Montana fifth wheel, the 3820 FK. FK stands for front kitchen, and a glorious front kitchen it is, raised up and overlooking a leather couch bedecked living room with a large tv and electric fireplace. The kitchen is located up a short flight of stairs and features a u-shaped dinette with a massive window behind it. There is a double sink, a huge refrigerator and freezer, a three burner stove, a small oven and a convection oven microwave. I can picture this RV parked in Cape Cod, overlooking the windswept beach of North Truro. Or nestled in the woods and near the waters of New Hampshire’s Lake District. There’s even a built in vacuum system – how convenient is that for folks with the three most shedding dogs ever?! It is indeed our dream RV, despite my usual reluctance to feel a need for a large rig for our small family of peeps and pups. The Montana is so perfect for us that I cannot deny it. The bedroom has a king size bed, plenty of floor space, large closet space with drawers at the bottom, and hook up for washer and dryer should you want to install them. There is a TV on the wall opposite the bed. Dare I say it, there is plenty of room for two people and three dogs to sleep on the bed – all at the same time! Just like at home. Now that is an RV bedroom we can really live in. 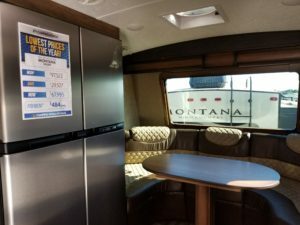 The Keystone Montana is a true vacation home on wheels, something you would park in one spot for a month or a summer at a time. 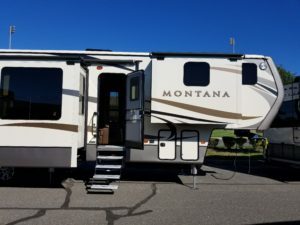 Comfortable and spacious, the Montana has tall ceilings (perfect for Rob’s height of 6 foot 3 inches), tons of storage, wide open spaces, and comfortable spots for sleeping, eating, working, relaxing and entertaining. Two couches in the living room open up to beds. And there are also two theatre seating recliners directly opposite the TV for perfect Star Wars movie evenings with large bowls of home made popcorn made on that beautiful stove. We can dream, can’t we? 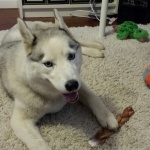 What would you say to a season of camping in such luxury with our three Siberian huskies, in a beautiful locale, for an entire summer?! The pups would really really love it!!! And their paw-rents might, too! We visited th e NJ RV and Camping Expo last weekend. 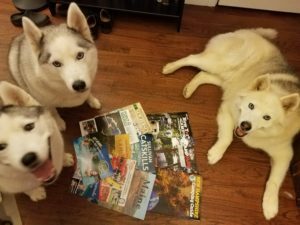 We came home with a host of brochures to share with the pups: camping guides from New Jersey, New York, Connecticut, Massachusetts, New Hampshire, Vermont, Maine, Pennsylvania and more. There was so much to look at at this expo – it really was overwhelming. I didn’t expect so many campgrounds to have representation. I could ask questions to my heart’s content. Of course, after the dogs’ needs are covered, the peeps look for amenities like heated pools and hot tubs, waterside camping, bike parks and hiking trails, and a well stocked camp store with local goods (like maple syrup in Vermont or farm fresh chocolate milk in New Hampshire). We also look for a good amount of privacy and spacing between camping spots. There’s nothing worse than being right on top of your neighbor’s campsite. After we visited all the campsite vendors, we came upon a sea of RV’s of all shapes and sizes. We already have our little Coleman Lantern Edition Travel Trailer and are extremely happy with it, but we still love looking at other campers. Most are just way too big for our needs. We consider our little Coleman home on wheels to be glamping already! However, some of these well appointed behemoths are way over the top. We can turn our noses up at all of them, save one.